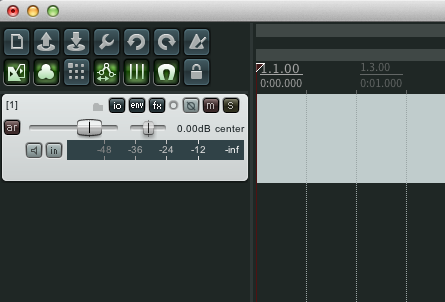 One thing that I have found in reaper is that I spend a lot of time fiddling with setting up tracks. This can include routing midi or audio in and sometimes routing midi or audio out. This also applies to using a combination of FX plugins. Getting some templates together can save you a lot of time and in some cases solve problems once you have the template saved. If you have an untidy mind as I do, this means any complex routing can be saved for use at a later date. 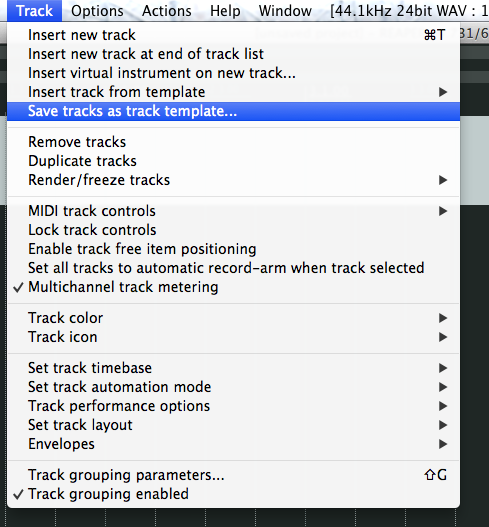 Let’s look at how to create a track template. First you need to add a track. So we have a simple track. Let’s add an instrument – I’m going to make this a drum track. 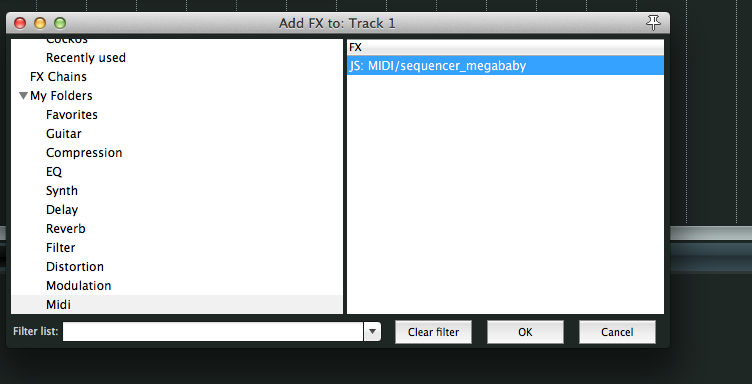 I’m going to want to use it with a plugin called Sequencer_Megababy. 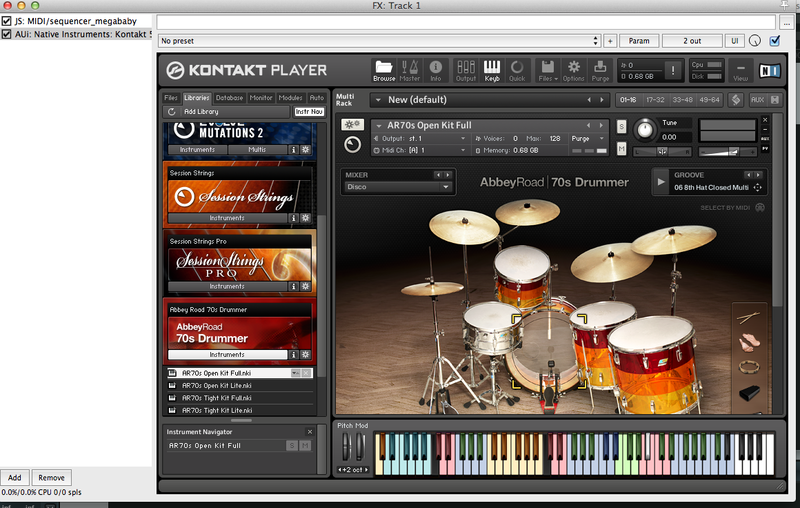 Then I’m going to add my drum plugin – Kontakt Abbey Road drums – this needs to go after Sequencer_Megababy in the chain. 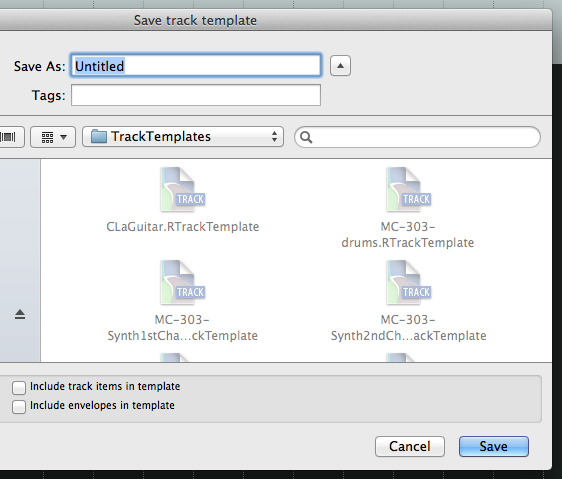 So now I have my track set up the way I want it I need to save it as a template. 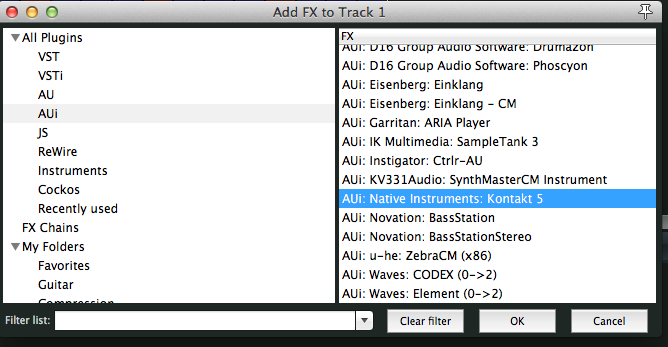 Close the ‘FX’ browser and go back to your ‘new’ track. 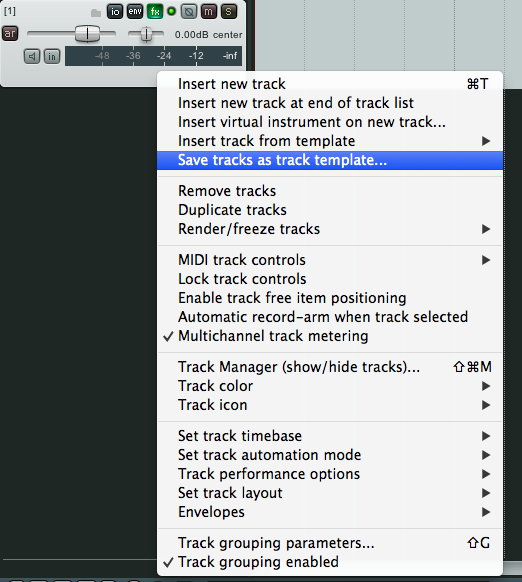 Or you can got to menu bar and use the ‘Track’ drop down. Give your Template a name – best to be descriptive. I’m naming mine ‘Drums’ – it’s my usual setup for drums. 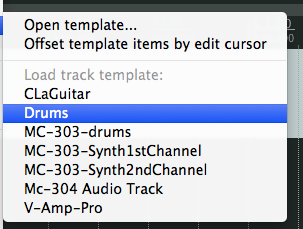 Now with it saved I can add it any time I need to use that setup for Drums. 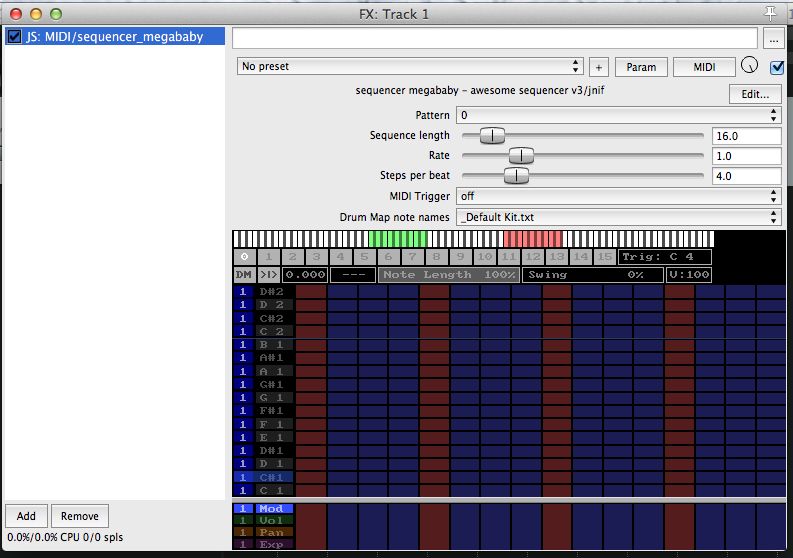 As you can see I have a few already setup – these are mainly midi output routing templates. The V-Amp pro is audio routing in for recording as is the MC-304 Audio Track. 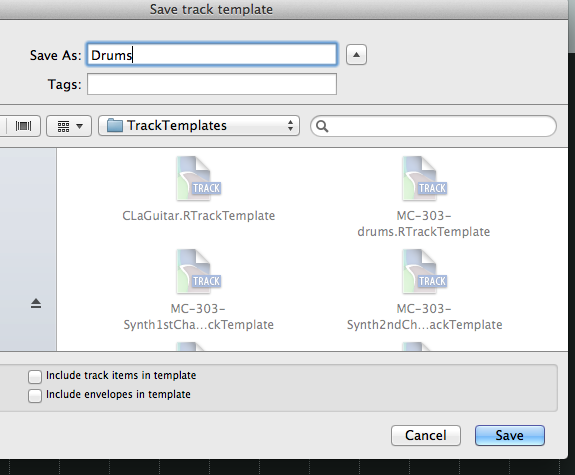 Tracks templates are invaluable, especially with anything you do a lot. I’ll deal with audio and midi routing in separate tutorials but combined with using templates you can create some good workflow. Also have a look at creating ‘FX Chains’ – I’ll be doing a tutorial on that too.